‘Hacking authenticity and open sourcing it for all’ is a bold aim that I have signed up to. This next hack is influenced by Star Wars and the great coach and mentor himself – Yoda. “Do or do not, there is no try” is a well known quote, see the 25 seconds of magic here. 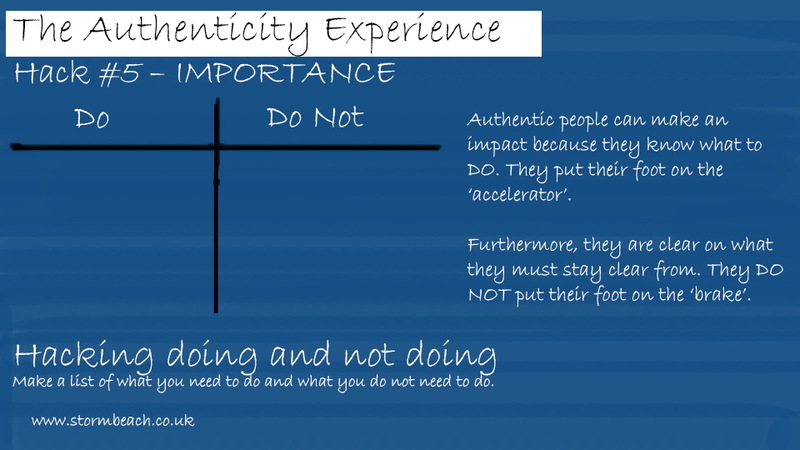 Authentic individuals never try, instead they commit, act and the deliver. But it’s not this word that interests me, instead it’s the concept of do or do not. Being authentic requires you to say yes to things and no to other things. If you say yes to something when you really mean no, then you are probably starting to lose your way. Know what you should be doing and what you should not be doing. After all, we can do anything we want but we can’t do everything. 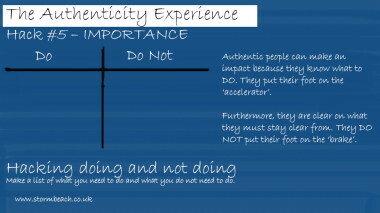 In the search for authenticity so many people only sign up to one half of the equation. They are desperate to state what they will be doing, and sometimes neglect what they should stay clear from. Being clear on the latter, makes sure you don’t stray off the path. Thus authentic people can make an impact because they know what to DO. They put their foot on the ‘accelerator’. Furthermore, they are clear on what they must stay clear from. They DO NOT put their foot on the ‘brake’.